I arrived at the Indian Scout shoot buzzing from a rapid intercity ride on my Duke. It would seem that my adrenaline fix for the day was done but the Scout had other plans. As I was to discover, this fantastic looking machine is hardly your regular blinged out attention seeker. Make no mistake, it will attract massive attention - it looks that good. Long and low, it's actually quite compact and inviting compared to its intimidating looking bigger brothers. The bike fits well too with a reasonable reach to the handlebars and forward set footpegs while the low seat should make it easy for all sizes. Shumi isn't very keen on the rear fender because he thinks it looks thick and out of place on what's otherwise a lithe design but the rest of us think it perfectly echoes the Scout of yore. This is how retro modern designs should be - contemporary and sleek from every angle but never leaving you in doubt of the legacy of the design. The instrument cluster has an analogue speedo with a digital screen that shows swappable readouts for time, engine temperature, rpm and more but there's no fuel gauge, just a low fuel warning lamp. Perhaps the only turn off is the number of logos, badges or I logos on the bike. They're everywhere - four on each tyre, on the dials, master cylinder, engine cases, there's even one stamped into the frame just ahead of the seat. I stopped counting past 25 but it should be close to 30. That's a ridiculously huge number and all this flashiness is only going to attract more of those endless questions. If I owned a Scout I'd print a t-shirt to wear over my gear that would read, "Made in America. Not an Indian brand and no, I am not a proud Indian riding a modified Harley-Davidson". Or a David Harleydson as one chap who had his facts mixed up enthusiastically asked us. 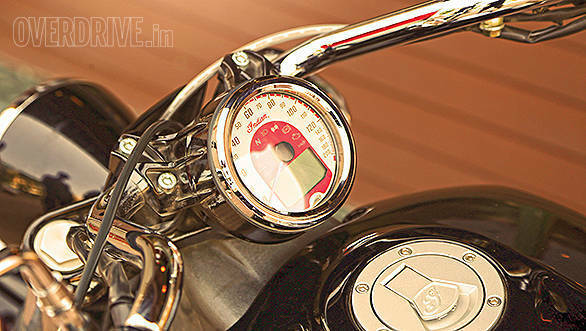 It's clear that the centre piece of this motorcycle is that beautifully crafted engine. However the 1133cc V-twin is not just the crux of the design but of the entire Scout experience. 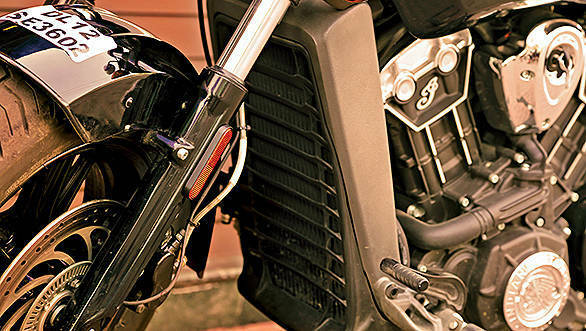 Liquid cooling, a counterbalancer and an eight-valve DOHC valvetrain makes it as relevant as any new age sport bike motor. It feels smooth and refined just like the lovely Thunderstroke 111 on the Chief series of bikes but the difference is that this thing is surprisingly hungry for revs. Whack the throttle and the rear will break sideways even in second gear. The only other cruiser I can recall that revs similarly was the Hyosung ST7 and that was because it borrowed an engine from the GT650 sportsbike. The Scout's engine on the other hand has been purpose built and like any good cruiser, it has a strong wave of useable bottom end torque. Unlike most cruisers though, it doesn't give up post 5,000rpm but keeps building until things get startlingly quick. You'll find yourself wanting to shift between six and seven thousand rpm as vibrations set in pretty hard but keep at it and you'll find the redline sits at a lofty 8,250rpm. Charge up through the precise gearbox and you'll find you're going a lot faster than expected. 140, even 160kmph comes surprisingly easily and given enough road, the Scout will max out its speedo at the 200kmph marking. However, the cherry on top is how flexible the motor is - 100kmph is a relaxed 3,400rpm burble while it can just as easily shoot from 0-100kmph in a blistering 4.5s. Burt Munro would be proud. 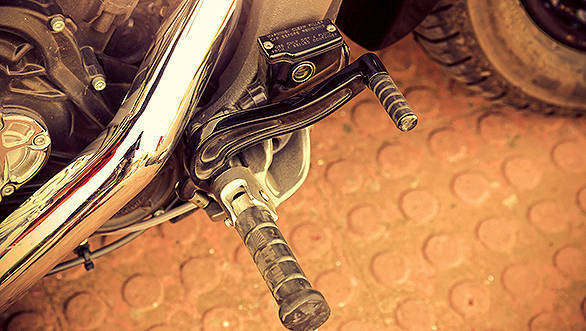 Braking is courtesy a single disc up front that feels dull at the lever, typical of a cruiser while the rear is strong and tends to chirp the rear wheel quite easily before ABS smoothly brings things under control. Stopping power is relatively quite good for the average cruiser but with the performance at hand we'd have liked more. The same goes for the fat Kenda tyres that aren't grippy enough. 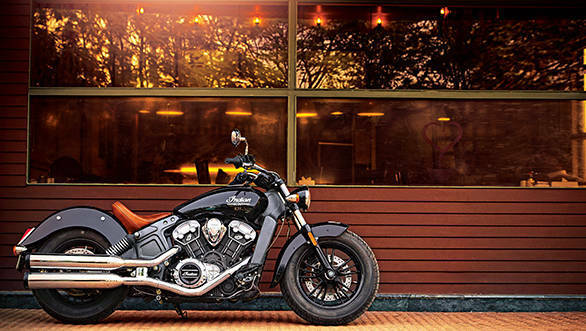 Read any of our stories on the Indian Chief range and you'll see how we rave about the phenomenally plush suspension and how brilliantly it deals with our roads. The same doesn't hold true for the sportier Scout which feels firm - well damped but firm. So you don't get harsh jolts up your spine with road bumps or depressions but the bad ones will pitch you out of that comfy and supportive seat. The good news is that despite the low rider look, the Scout dealt with the most foul of speed breakers we could find, albeit with some cautious riding. More good news is that this motorcycle likes corners! Not the sharp and narrow ones like Shumi dealt with in New Zealand but show it a long and flowing road and the bike settles in confidently with the long wheelbase giving you a steady pat on the back letting you know all is fine and that you should go have some fun. 31 degrees of lean also mean quite a bit of give before the pegs touch down. Just remember to watch out for the bumps. City riding is effortless as the Scout feels lighter and more agile than its 253kg kerb weight suggests and the front wheel doesn't extend too much either. However the heavy clutch will start to get tiring if you're mired in traffic and throttle can be a little inconsistent and choppy on closed to open transitions. 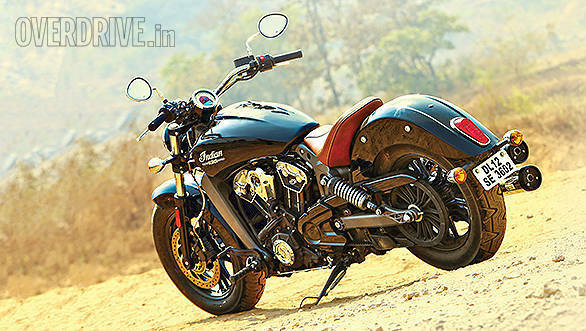 The Scout has a lot going for it starting with its affordable Rs 11.9 lakh ex-Delhi price tag. That is a staggering Rs 16.5 lakh cheaper than the Indian Chief Vintage that Shumi lived with for a week. 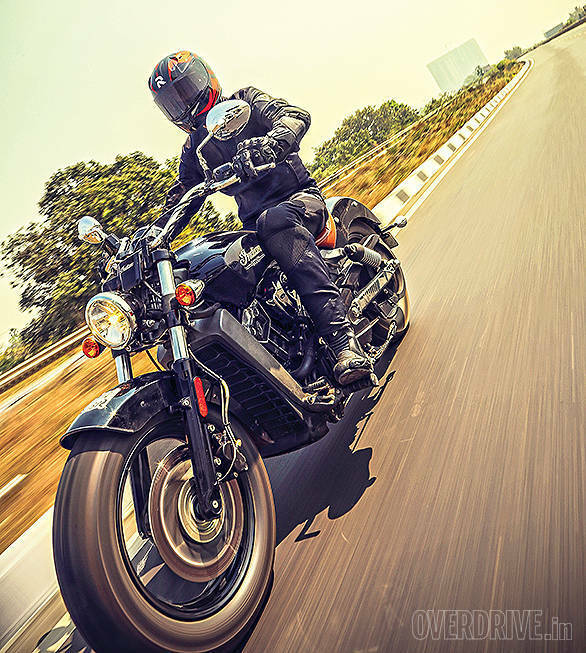 Then there's the handsome looks and the head rush of performance that makes it one of the most urgent cruisers I have ridden. It's a thoroughly modern machine with a state of the art engine mated to an eager chassis. There's also a myriad of customisation options including a pillion seat, wind protection and plenty of leather bag and seat options. But if you ask us the bike looks best unmolested by the options list There's not much to fault with it and Indian should be selling quite a few of these beauties once the dealership network expands. 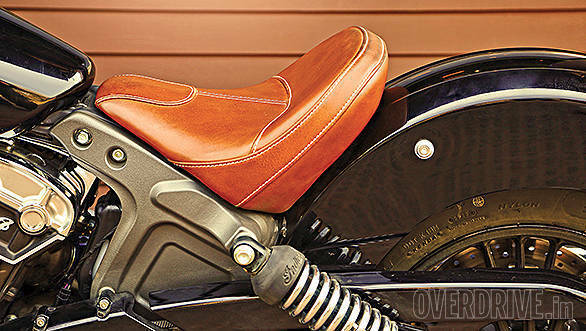 The hunt for an Indian motorcycle that hasn't blown our socks off continues. Not that we're looking too hard.